Reaction Engines announced today that testshave verified that the technology is in place to build its Sabre engine, whichlies at the heart of its reusable, single-stage-to-orbit Skylon spacecraft. The news brings the promise of not onlyroutine, affordable access to space but also point-to-point travel at Mach 5and major improvements in fuel efficiency for existing airliners. Theannouncement featured a major endorsement of the technology by ESA, has hasworked with the British company to evaluate the results of the tests, Reutersreports. “ESA aresatisfied that the tests demonstrate the technology required for the Sabreengine development,” the agency’s head of propulsion engineering Mark Ford tolda news conference. The space plane, dubbed Skylon, only existson paper. What the company has right now is a remarkable heat exchanger that isable to cool air sucked into the engine at high speed from 1,000 degreesCelsius to minus 150 degrees in one hundredth of a second. This core piece of technology solves one of theconstraints that limit jet engines to a top speed of about 2.5 times the speedof sound, which Reaction Engines believes it could double…. 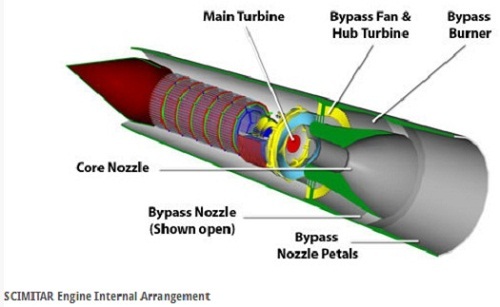 The Sabre engine could take a plane to fivetimes the speed of sound and an altitude of 25 km, about 20 percent of the speed and altitudeneeded to reach orbit. For space access, the engines would then switch torocket mode to do the remaining 80 percent. Reaction Engines believes Sabre is the onlyengine of its kind in development and the company now needs to raise about 250million pounds ($400 million) to fund the next three-year development phase inwhich it plans to build a small-scale version of the complete engine. Move Over, Jet Engines! Here Comes SABRE! Reaction Engines Ltd. can announce todaythe biggest breakthrough in aerospace propulsion technology since the inventionof the jet engine. Critical tests have been successfully completed on the keytechnology for SABRE, an engine which will enable aircraft to reach theopposite side of the world in under 4 hours, or to fly directly into orbit andreturn in a single stage, taking off and landing on a runway. In addition to being able to power a reusable, single-stage-to-orbit space plane, Reaction Engines’ SABRE propulsion technology could help to power a Mach 5 transport that would be able to fly from Brussels to Sydney in less than two to four hours. The British company has designed a SABRE-derived SCIMITAR pre-cooled engine powered by liquid hydrogen that uses the company’s lightweight heat exchanges. The engine would be capable of sustained Mach 5 flight. [size=1.05em]The A2 vehicle, which is designed to be propelled by the Scimitar engine, has exceptional range (ca. 20,000 km both subsonic and supersonic) and is therefore able to service a large number of routes whilst simultaneously avoiding supersonic overflight of populated areas and the related sonic booms that can be heard on the ground. Its good subsonic performance enables it to service conventional subsonic overland routes. Reaction Engines is performing work on the project under the Long-term Advanced Propulsion Concepts and Technologies (LAPCAT) study, which is being 50 percent funded under the European Union’s Framework Programmes for Research and Technological Development 6 (FP6). Via the BBC’s Jonathan Amos and New SpaceWatch’s Clark Lindsey comes a report that the British government wants to helpfund the development of SABRE engine, which will power Reaction Engine’s Skylonspace plane. The plan was included in a spendingdocument produced by Chancellor of the Exchequer George Osborne. The documentis not specific on how much the British government would invest in the project. GMT+8, 2019-4-22 08:34 , Processed in 0.358800 second(s), 25 queries , Gzip On.